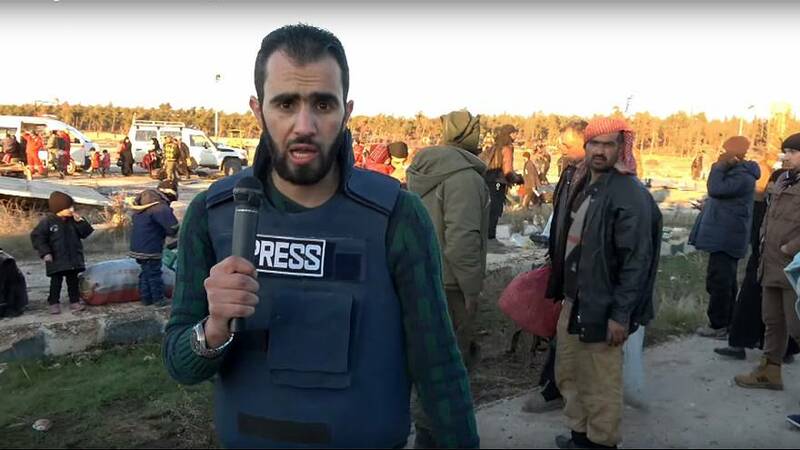 Prizewinning 29-year-old independent journalist Hadi Abdullah has been reporting in the west of the province of Aleppo, controlled by the Syrian opposition. “The civilians who left Aleppo were crying for having to leave their city in these conditions. They were saying that the international community gave them two choices: being killed all together inside besieged Aleppo, or being forced to leave their homes. Someone told me that he knew that both choices are crimes against humanity. I spoke with a child and he told me about the bombings in East Aleppo and about his fears and how much he had cried. A woman came to me crying and told me on camera that she had no news of her brother since yesterday and knows nothing about him. Another brother was killed a month ago”. There have been several reports of convoys of people desperate to flee the city’s fall that have been turned back, or worse. It seems orders to let civilians through are being ignored by some. “The 8th convoy was supposed to arrive this afternoon in the western part of Aleppo province, (controlled by the opposition), where I am,” continued Hadi. “But we were surprised that a barrier was built up by the Iranian militia and Hezbollah militia to prevent the convoy from advancing. They put their tanks in front of the convoy and started shooting in the air. A few minutes after I contacted an activist who was in the convoy and also some civilians who were there. They told me that the Iranian militia ordered them back to East Aleppo. This happened after the arrest of 10 people and after another three were crudely executed in front of everybody. UN Humanitarian Coord Stephen O'Brien: Lebanese Hezbollah militias are actively impeding deal to get civilians out of Eastern Aleppo. There are more than 50,000 people in besieged Aleppo. If you want to talk in an objective way, the Russians want to evacuate those civilians but they don’t have the control over the Iranian militia present in the region.